My Landlord Refuses to Replace or Repair the Furnace. What Can I Do? Home » The Law & You » My Landlord Refuses to Replace the Furnace. What Can I Do? My Landlord Refuses to Replace the Furnace. What Can I Do? A viewer with a special needs child is worried about his gas furnace. Yet his landlord refuses to repair or replace it. Is there something he can do legally? Attorneys Greg Fellerman and Ed Ciarimboli have the answer. Dave Kuharchik: We’re talking about an issue today of a landlord not doing necessary repairs to an apartment. 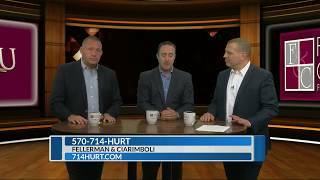 Joining us as always in the virtual law center are Attorneys Greg Fellerman and Ed Ciarimboli. Guys, good to see you both. Ed Ciarimboli: Good to see you, Dave. Did you have a good Labor Day weekend? Dave: Yeah. How about you guys? Ed: It was really nice. Hot. Dave: Yeah and it’s still hot. Eventually, it will cool down but today we’ve got a situation about what’s to come for one tenant. Dave from Williamsport says, “What can I do if my landlord refuses to repair or replace my gas furnace? I have a special needs child I’m living with and I’m worried that fall is calling up.” So what can Dave do about the situation with the furnace? Ed: Well, speaking of heat, this is a great question. One of the things that you can do is you can make the repairs yourself or replacement yourself and then withhold whatever the amount of money was from your rent moving forward. Or, whatever amount of money is for the furnace. You got to get it fixed. If the landlord’s not going to do it, you’re going to have to take the appropriate steps to do that and put the money into an account and withhold it from the rent. Greg Fellerman: Or you can move out. If you don’t have a place that is habitable, then you can leave. Give the landlord the opportunity to fix it. And again, right now in the summer, it’s not that big of an issue but as fall and winter start rolling around, I would try to force the landlord. I would send letters, emails documenting it because if he does come back after you, you want to make sure you have a paper trail. Ed: The landlord right now is in clear breach of the lease. He’s breaching the lease so you can move out or if you want to stay there because of your child, those are your options. Dave: Next couple of days are not a big deal but a couple more weeks, it’s going to become a big issue. Dave: All right, if you need legal advice or direction, you can call the guys at the office or check them out online. Results matter. Attorneys Greg Fellerman and Ed Ciarimboli, guys, thanks.